Sales 2.0 is the New New Thing. I hate to be a contrarian (Oh. Ok. I love it. Why change the habits of a lifetime?) but… it’s not the end-all and be-all that it’s being touted as. Here’s the good news: Sales 2.0 is good for driving people to you. By simply offering a webinar, a free e-book, a White Paper, or some incentive, you can get folks to your site. If your material is good enough, they will Twitter about you, put a TinyUrl about you, link to your site, write you up on their blog. You can gather their data, have some sort of passive or active follow up, use the names on an opt-in list, and get hundreds or thousands of new names on your database. 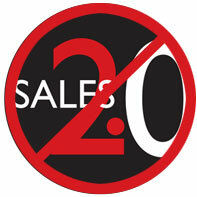 If you want new names and a large database, Sales 2.0 is for you. I know many, many marketers pouring their hearts out to develop wonderful content to send out as bait to attract attention. And it works: after your event, you can follow people up with an email, or hire a telephone sales group to follow up with a phone call. Allegedly, SalesGenius has a dedicated phone sales crew that will call up a new contact within minutes of them signing up on their contact form. And, what does that give you? An opt-in list (a different question – did the people opt-in for you to contact them after the event?) to send marketing material to. If you don’t actively follow up, you potentially have a new group of people who have been introduced to you and your material, and will hopefully go to your site and learn more or buy something. Hopefully is the operative word here. And here’s the bad news: how do these folks decide to convert? How do they choose to make a purchase once you’ve captured their name? After you’ve sent them emails (and emails and emails)? Because this is still a one-way pitch: they are basically unknown addresses, who will interact meaningfully only if they choose to, and only make a purchase if they need exactly what you are offering at the exact moment you are offering it. Solution data is the last thing buyers need when making a decision to purchase. People only use data to make decisions with at the point they need the data – usually as the last act in a purchasing decision. Not before. Primary decisions are made on values. With lots of buy-in necessary. Let me say that a different way. Sales 2.0 suffers from the same problem that all sales suffers from: the assumption that because there is a need, or a problem, the only thing that must occur is some sort of hook-up between the need and the ‘right solution’ and, miraculously, a purchase will occur. We all know that, sadly, there is a less than 10% conversion rate in sales. And yet the myth persists: great product, trusted partner, perfect solution, good prospecting, great closing techniques, getting past gatekeepers, getting to the decision makers, understanding who the decision makers are, having a great price or a special deal – yup. Sales keeps coming up with ways to persuade, manipulate, position. But still, after centuries of lots of new, new things, there is still a <10% closing rate. Why, you ask? Ah. I’m going to tell you why. Because (obviously) that’s not how people buy. Because the sales model only manages the solution-decision end of the buyer’s buying decision. Because a buyer – whether an individual or a group – has a bunch of internal, subjective, hidden, mysterious, unconscious (Are you getting the point? There is no way an outsider can influence this using the sales model.) factors and criteria they need to address internally in some way, before a purchasing decision can be made. And many of these factors are deep within the buyer’s culture, and have nothing directly to do with the Identified Problem. It’s the lunch meeting with the boss’s boss that was canceled; the fight your prospect is having with the next department. It’s the relationship and rules and people stuff we can’t control with the sales model. But has to get done. Your buyer needs a new piece of software? or a team building course? But they have been doing what they doing for quite a while and haven’t changed anything. Obviously, the status quo will continue until it gets enough buy-in to agree to a change. Indeed, making a purchase is a change management issue – a systems issue, if you will, that can be influenced by Buying Facilitation™. It’s not so simple as problem/need + solution = purchase or we’d be closing a lot more than we close. Like sales, Sales 2.0 is a push modality, even though it professes to be a pull model. Because it doesn’t help buyers maneuver through their unique and idiosyncratic hidden dynamics that need to buy-in to making a change at this time – independent of the need. So Sales 2.0 is basically a great tool for sales using a numbers game: have enough names, throw enough spaghetti on the wall, and some of it will stick. to automatically convert an email address to a buyer. Ask yourself this: why do you assume that the webinar, or the White Paper, or the Podcast you are offering is a precursor to a buying decision? Just some food for thought. And because I like being a contrarian. My fear is that Sales 2.0 will be so over-hyped that it will be ultimately be discounted for not living up to expectations. Maybe Sales 2.0 only turns out to be a smarter and more professional way to think about prospecting. If the movement converts thousands of salespeople from "smilers and dialers" into strategic and targeted marketers, then it will have contributed more to the profession than most other ideas over the past 100 years. Why can't we just be happy with the promise of that potential outcome (for now)? Since you advocate Buying Facilitation as a better alternative to the old skul sales model can you let us know how much conversion rates have been recorded with the BF model since you started? I can give you conversion rates for typical sales – not 2.0, cuz Buying Facilitation(R) would have to be used via telephone reps in conjunction with 2.0 and no one is doing that yet. Working with Wachovia small business bankers, they were making 100 appointment calls, getting 90 no's/10 yeses and closed 2 after 11 months. Using Buying Facilitation, they made 100 calls, got 37 requests for appointments, and closed half of those in 2 months. With a $50M sale with KPMG, they went from a 3 year sales cycle, to 4 mo. Because we teach buyers how to manage all of the internal stuff they have to do first we get very different results. it's used before discussing solution, or managing need. overall, we've gotten between 200-800% increased results over our control groups, in companies like IBM, Kaiser, Bose, Intuit, Boston Scientific, Morgan Stanley, Dryfuss-Melon, etc. Before you'd want to take a program with me or go through the 'cost' of learning my material, you'd want to know it fit with the way you do business, make sure it 'worked' (according to your criteria), you liked it, your boss would like it, it would be learnable, your clients would like it, etc.. Only when it fit your internal criteria, your 'team dynamics', etc. would you even take the next step to learn details. So first I would lead you through a sequenced decision model i've developed that would lead you through all of the decisions you'd need to make up front. Then you'd know where Buying Facilitation would fit, what you'd need to shift (and if you were willing to change), who you'd need to get buy-in from, and THEN when i gave you a pitch, you'd know how to buy. Buyers need to do this anyway before making a purchasing decision.Sales hasn't handled that end of the subjective, hidden dynamics that buyers have to deal with. But this is a way to help with that end.. Excellent topic and insight Sharon Drew. Another wonderful writing in this post, Sharon Drew. I read it twice, and while reading it I was able to hear you again, and follow your structured dynamics with joy. Combien de fois avez-vous été pris dans le cycle des services téléphoniques automatisés? Abercrombie Outlet, vous poussez 15 numéros et finissent par revenir au menu principal et n’a jamais parler à un représentant des ventes. Les gens sont avides d’une interaction personnelle sur le marché. Cherchez des fa?ons de rendre votre entreprise une expérience personnelle que vos clients apprécieront. Apprenez à conna?tre quelque chose sur les gens qui marchent à travers les portes. Laissez les gens qui visitent votre site web savez quelque chose sur vous. Yeh, il est plus facile de faire confiance à un individu d’une grande entreprise impersonnelle … et la confiance est cruciale pour la construction d’un bassin de clients fidèles.